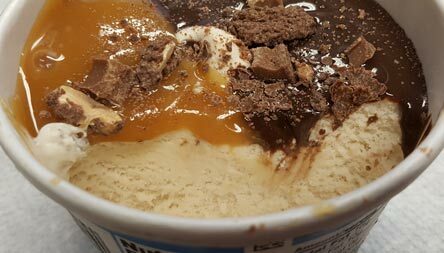 New for 2016 Despite what the press release says, this is not new for 2016, it's just renamed for 2016, and the worst part is that I didn't like it when I tried it back in 2012 when it was called the nutty caramel crunch sundae. See, even I am not immune to accidentally picking up a renamed, redesigned treat once in a while. 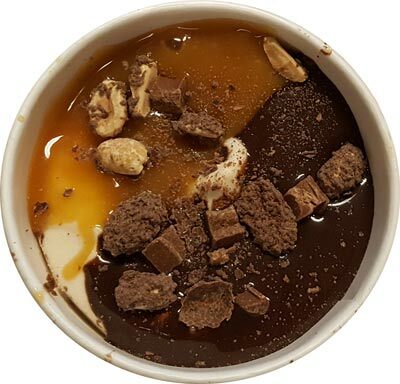 I'm sure a few of you are thinking "but the cup graphics show grabbing the caramel and fudge at the same time" and that is a valid point, but this sundae still doesn't work when you try it that way. It's like the sauces are like oil and water and refuse to work well together. It's gone now and I don't think that was worth 350 calories.... or 88 cents really, and that's a really sad statement to make. Maybe I'm having an off day but this didn't click on any level. It just felt like a chewy fail from start to finish. side note: I would have reviewed these sooner, but every time I find them, the sauces are always leaking out of the sides of the container. I decided at 88 cents to risk it though. This is just the old "caramel sundae cup", right? I would have guessed that one had vanilla ice cream but the rest is exactly the same, so perhaps I am remembering correctly. 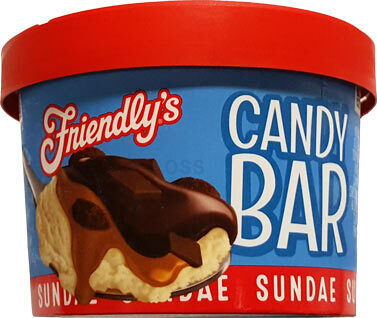 I used to love sundae cups as a kid (especially the Reese's and that mint one with the peppermint patty on top) but they really are always disappointing now...maybe because they seem too small now! What did the nougat ice cream taste like? @Dubba Have you tried the Edy's French Silk? I just read the memories post with the picture of Friendly's and Edy's. It sounds as if you don't care so much for Edy's anymore. Just curious if you've had this kind? I really like it. I take Hershey's syrup with me when I eat it. Lol. The reason is bc; I don't like to just dump some on top then go sit down. You'll eat the top off then need more. So I take it with me:) It kind of cuts out the mocha taste and makes it so much better. Also I'm new here and just wanted to say, I love you're writing style and sense of humor. Makes me wanna read more. I wish you wrote about more than ice cream. That would be nice. ***Also what exactly is your top three go to ice creams? Like what's a constant in your freezer? Mine are B&J Cherry Garcia, Edy's French Silk, and Blue Bunny Peanut Butter Party(melted,then stirred up, like a DQ Reese's Blizzard). Oh one more thing. Have y'all tried the New Dove Sorbet Bars? I have a box in the freezer. Haven't opened them yet. I have the Raspberry flavor.